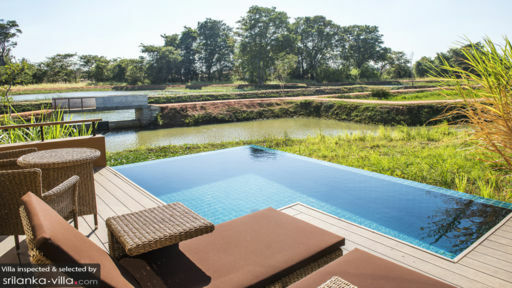 Water Garden Sigiriya in Sri Lanka is a luxury hotel featuring individual villas offering a chance to live amidst neighbouring lakes and water streams. Established in harmony with surrounding nature, the hotel prides itself in extending a unique experience to guests. 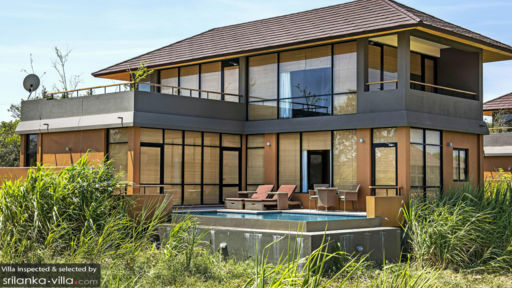 The duplex twin villas are an opulent affair with two bedrooms featuring glass walls and large windows overlooking the splendid fields and skies overhead. A private plunge pool, a massive sundeck that serves as a vantage point to gaze at wildlife swarming about, and several facilities are provided to guests! The Duplex features two massive bedrooms that have been furnished with great elegance and style to enhance the outdoor setting even when lounging indoors. Sat facing the glass walls that provide panoramic view are the king-sized and twin beds in each room, respectively. There is satellite TV, mini-bar, tea/coffee available in the bedrooms so you are at ease and can be comfortable. The four-poster king-bed lets you relish a good night’s rest, much-needed after a day of walking and many adventures. There are writing desks in case you wish to work on something and Wi-Fi access for convenience. Each bedroom is accompanied by en-suite bathroom that is fitted with a freestanding bathtub, twin vanity sinks, and other necessary amenities. A boutique hotel with excellent service, Sigiriya’s villas have been fitted with private plunge pools flanked by luscious greenery and vegetation. While you swim around and wade in the pool, the sounds of nature will keep you company. Relax on the sunbeds or work on a tan while you lounge on the pool deck. There is even an alfresco rattan dining area, so guests can experience a fine dining experience right under the starry-night sky! Head to the lake surrounding the villa for a stroll or simply gaze at the wild gardens for a wonderful time spent outdoors. 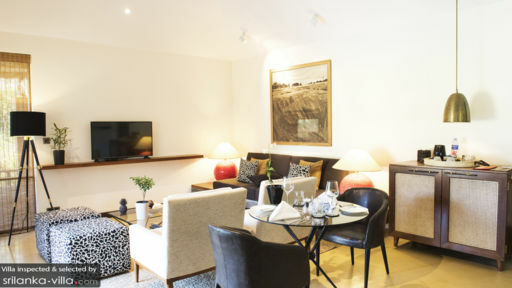 The small and cosy living area at Sigiriya’s duplex twin villas is found on the ground floor of the two-storey home. It has been furnished with a contemporary aesthetic featuring a pastiche of prints, colours, and ideas. The air-conditioned space is much more than just a living area as it features glass walls that give you the luxury of an enviable view of the gardens. You can rest up on the comfortable sofas or take this time to catch up with friends or family while you’re in such an inviting ambiance! Sigiriya Hotel extends its five-star amenities to guests wherein it lets you access the excellent dining pavilion which serves a host of continental cuisines made using locally-sourced, organic ingredients. There is even the Twin Level Bar with an array of cocktails and other beverages, alfresco sitting overlooking the famous Sigiriya Rock, and an extensive menu. Michelin-star quality food followed by world-class drinks would mark the perfect end to an even more exhilarating day! There are plenty of services on offer at Sigiriya Hotels including a personal butler service that caters to the needs and requirements of guests. Recreation is an important aspect of the luxury hotel thus, there is an outdoor swimming pool, buggies to take you around the property with its lakes and splendid locations, and other activities such as billiards, cycling, and even archery! As you are close to Sigiriya Rock this might as well be the first place you explore on your travels! With its rich history and dedicated upkeep, there is so much to learn from its inconspicuous structure and labyrinthine inner quarters. For a more adventurous experience, Minneriya National Park with all its flora and fauna. Hosting a UNESCO World Heritage Site is the kingdom of Dambulla, where the Rock Temple is a great place to visit!